Rebecca “Becky” Bodony is the Managing Attorney of the firm’s Chicago Office, Chair of the firm’s Australia & New Zealand Practice and Senior Immigration Counsel. Becky earned her undergraduate degree from the McDonough School of Business at Georgetown University. She earned her Juris Doctorate degree and a Masters in International and Comparative Law from Duke Law School. She has lived in Spain, Argentina and China. Becky focuses on business and investor visas, especially E-3, H-1B, E-2, L-1, EB-1, O-1, and EB-5. She is admitted to practice in New York and can practice immigration law in any state of the U.S. 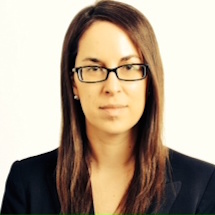 Prior to joining Davies & Associates, Becky was an Associate in the Litigation Department at the New York office of the international law firm White & Case LLP. She focused on complex commercial litigation and also specialized in various immigration issues for the firm’s clients (including E-Verify and visas and permanent residency for people with “extraordinary abilities”). She received an award for her pro bono work defending children facing deportation. At Davies & Associates, she specializes in work visas and permanent residency for business and investor clients. She focuses on temporary visas and permanent residency for specialized workers (H-1B, E-3, TN, EB-2, EB-3), individuals with extraordinary abilities in the arts/business/athletics (O-1, EB-1), and intra-company transfers of managers, executives and specialized workers (L-1, EB-1). She also represents foreign investors seeking temporary visas to run businesses in the U.S. (E-2) and those seeking investment-based green cards (EB-5). An L-1A intracompany manager transfer visa and an O-1A extraordinary ability visa for two engineers at a large industrial manufacturing company in Colorado. E-3 work visas for Australian nationals to perform jobs in the U.S. including an assistant music tour producer, a museum exhibition director, a sales manager, a financial products marketer, project managers, and other professional occupations. H-1B visas for two computer professionals at a social media company. An L-1A transfer visa for the manager of a Canadian company to start a wellness and yoga business in California. TN work status for a Canadian social worker in California. An O-1 extraordinary ability visa for a British equestrian professional. An O-1 extraordinary ability visa for an Italian music composer. An E-2 investor work visa for a French national starting a computer programming company in New York. Approval of multiple EB-5 investor green card applications for investors in Regional Center projects.